Oil prices continued to retreat on Wednesday as concerns over softening demand for fuel amid global economic slowdown dented market sentiment. In early trading the prices got some boosts from falling U.S. crude stockpiles last week and the latest U.S. Energy Information Administration (EIA) report indicated slowing growth in U.S. shale oil output in the coming years. EIA said on Tuesday that it expected shale output to rise to a record high in February, adding that in the longer term, the production growth would slow. However, the outlook for lower supply was offset by the deepening concerns over a dented demand for fuel caused by clear signs of global economic slowdown. The International Monetary Fund (IMF) on Monday projected global growth at 3.5 percent in 2019 and 3.6 percent in 2020, 0.2 and 0.1 percentage point below last October's forecasts. Traders also looked to the possibility of U.S. sanctions on Venezuelan oil sector, which would lead to a tighter market. 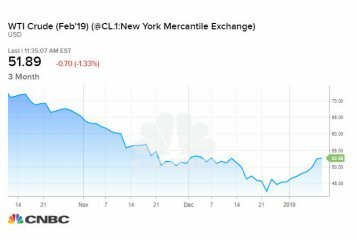 The West Texas Intermediate for March delivery fell 39 U.S. cents to settle at 52.57 dollars a barrel on the New York Mercantile Exchange, while Brent crude for March delivery slid 36 cents to close at 61.14 dollars a barrel on the London ICE Futures Exchange.